Dr. Maya Angelou is one of the most renowned and influential voices of our time, most notably recognized for her memoir I Know Why the Cage Bird Sings. Hailed as a global renaissance woman, Dr. Angelou is a celebrated poet, memoirist, novelist, educator, dramatist, producer, actress, historian, filmmaker, and civil rights activist. Born on April 4th, 1928, in St. Louis, Missouri, Dr. Angelou was raised in St. Louis and Stamps, Arkansas. Her life was one of extraordinary trials as well as triumphs, awarding her over 50 honorary degrees, 3 Grammy’s, and a legacy to live on for generations to come. 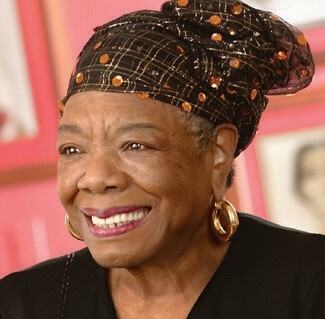 Angelou’s major works have been labeled as autobiographical fiction, but many critics have characterized them as autobiographies. She made a deliberate attempt to challenge the common structure of the autobiography by critiquing, changing, and expanding the genre. Her books center on themes such as racism, identity, family, and travel. Dr. Maya Angelou passed quietly in her home before 8:00 AM on Wednesday, May 28, 2014. Her words and actions will continue to stir our souls, energize our bodies, liberate our minds, and heal our hearts.